As it had earlier promised and scheduled, Infinixmobility has pushed the official Android 7.0 Nougat OTA (Over The Air) Update to Infinix Hot 4 (X557) devices. 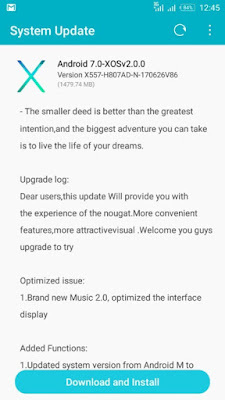 Few months back, we announced a Nougat Beta 2 file for upgrading by flashing in the file using Stock recovery (T-Card version), but in this case, you are expected to upgrade your phone using OTA (Over the air) which is the official way. Upgrade from Marshmallow to Nougat. Supports Split screen by long pressing recent button for partial apps. Brand new pull down button added. Horizontal swipe added to change wallpapers in Magazine lockscreen interface. Brand new Music 2.0 added and to optimized the interface display. If you are a Hot 4 X557 user, you should get the update notification via OTA. The new software update is available via OTA (Over The Air), and it weighs in at around 1.5GB in size. You probably need to connect to a fast Wi-Fi network or subscribe for at least a 2GB data plan for the download, make sure your phone is not rooted and also charge your battery to at least 80% before proceeding with the software update. You should see the new update, then select the update and install.